Recently, I had to look after PBTS on Cisco ASR9K platform and faced some issues, here are some results about my tests. PBTS has the same goal as CBTS on Cisco IOS (Class-Based Tunnel selection) but for Cisco IOS-XR. 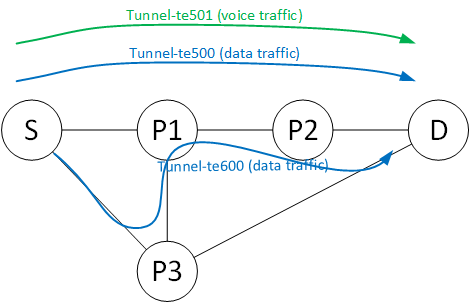 It provides a tool to direct traffic into specific RSVP-TE tunnels (in the future Segment-Routing tunnels) based mainly on different quality of service criteria. I was quite confused in terms of configuration, in my SP studies I learned that we have to configure each RSVP-TE tunnels with a policy-class corresponding to an EXP field. But in reality the policy-class is not supported on the ASR9K. On the CCO docs it is not quite clear also. The other solution is to use forward-class statement instead of policy-class, but it is not straight forward as the policy-class. I already heard about forward-class when I played with PCEP. Back to our example, here you have to classify the traffic at each ingress interface (like policy-based routing). By default there is a class-default as for qos policy-map (forward-class value of 0), I will use it for my data traffic. With this configuration I have my voice traffic going through tunnel-te 501 and my data traffic load-shared among tunnel-te 500 and 600. So always create a default tunnel for traffic that is not redirected to a tunnel through a forward-class. It should be updated. I hope that this post clarified a bit PBTS! Thanks a ton for the great readout. I am wondering if in your testing label forwarding was extended to Customer or CE since you are matching EXP5 bit on the ingress. So I am expecting the use of DSCP or CoS, CS mapping for admission control. I have been testing PBR with EXP bits and admission control on the PE nodes is a bit tricky. I am searching for a simplistic approach to set a specific forward class for a specific customer then select the ingress tunnel thus the egress PE.